Though Play does a far better job of this than pretty much anyone else I've seen, you're still dealing with special syntax in your HTML templates for accessing your Scala code. This is incredibly problematic when there is a separation of designer and programmer. Life becomes quickly more difficult when the programmer injects all the Play-specific code into the HTML file that came from the designer and then the designer needs to make a change. Not only does it become difficult for the designer to even preview what the content should look like now, but it is highly likely that the designer will mess something up when they are trying to make changes to the HTML. This was something I spent a lot of time considering and trying to come up with a better solution for in Hyperscala. I have worked at a lot of large companies that have teams of designers and teams of developers and it is incredibly painful bridging that gap. In Hyperscala there are actually several solutions to this problem, but the best one for this specific scenario, I believe, is DynamicContent. We've discussed this in a previous post and demonstrated it in yet another post. The idea is keeping the HTML clean and pure and the developer simply loads in only what they need to manipulate by the HTML 'id'. In my opinion, this is the simplest solution and a much cleaner separation between the designer and the developer. Yes, there is module support in Play, but it is confusing at best and extremely limited at worst. There is an inherent problem in any framework that doesn't have complete control over the HTML and Play simply does not. The way Play works is very similar to JSPs where content is injected but the HTML is never parsed or comprehended. This leads to several problems when you have modules that need to introduce something like jQuery but shouldn't load it multiple times and want to avoid an issue where another module is trying to load a different version. These are complicated issues that need to be dealt with in large web applications. In Hyperscala the Module system is incredibly powerful and solves all of these problems incredibly well. Not only that, but a Module in Hyperscala is dead simple to write and even more simple to use. Any framework that needs its own console in order to create an application is too complicated. Yes, I agree that it's cool that the Play framework has its handy-dandy console utility to create your application for you, setup your IDE, and probably even brush your teeth for you. However, I very much dislike "magic" that happens and is unexplained. I prefer to understand what is going on under the hood and though you can do this in Play, the decision was made as a default route to hide this from the developer. I prefer to work with frameworks in which you add a Maven dependency and then start writing some code. I don't want configuration files. I don't want a bunch of boilerplate code that is generated on my behalf. I want to instantiate something and run it. This is exactly what Hyperscala does. Once you include your Maven dependencies for Hyperscala you need only create an implementation of Website and add a Webpage to be up and running. In Play you have a minimum expectation of an Application.scala, index.scala.html, application.conf, and routes file. In an effort to compare Hyperscala with Play practically I decided to take an example from Play and re-write it in Hyperscala. 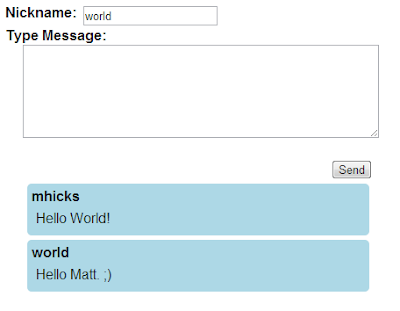 My hope was for a simple 'Hello World' example to keep it simple and straight-forward, but what Play considers their 'Hello World' example is quite a bit more than that. It will have to do. This is fairly simple. The idea is that this page asks you for your name to display, the number of times to repeat it, and a color. When you hit submit, it validates the form (based on the validations specified near the top of the page) and then either displays errors or writes out the name you specified the number of times you specified in the color you specified. Notice here that the form validation process is hard-coded, so no special handling is necessary. I point this out now because in Hyperscala there is no "default" for how validation should be handled so it takes a little more code (but not much). Next we take a look at the HTML files defined for the display. It's fairly clean and I'm sure once you get used to the Play syntax it becomes easier to grasp. However, this would be quite difficult for a designer to work with. I'm sure there is a better way to represent the page for designers, but then you obviously lose out on much of the power of Play. Now lets take a look at how this same functionality would look in Hyperscala. Like I've said several times now, there are many ways to accomplish the same task in Hyperscala and this is just one way. This is our basic HTML for the page. Notice there is absolutely nothing specific to Hyperscala or non-HTML in the file at all. I've extracted the 'configure' page out into this snippet because we're not only going to replicate Play's Hello World example, but we're going to leverage the Realtime module of Hyperscala to avoid doing a POST and thus keep you on the same page for the entire experience. I could have replicated the form posting utilizing FormSupport mixin, but hopefully this will work as a good example of how easy real-time communication is in Hyperscala. Again, notice that there's nothing special about this HTML. It can easily be previewed in the browser and edited by a designer. Not much to see that hasn't already been explained in past examples but there are a few things of note. First, notice the call to Realtime.connectStandard(). This, as the scaladocs says, connects all inputs, textareas, and selects to fire change events and buttons to fire click events to the server. We can do this manually, but this saves us a few lines of code. The other thing of note here is the adding of validation. The 'addValidation' method is received as an implicit conversion on FormFields (input, textarea, and select) by importing org.hyperscala.ui.validation._. We utilize some built-in validations and use the ClassValidationsHandler to apply the error class to the outer container and set the message to the error container when validation fails on a field. Like I said before, how validation works in Hyperscala is not built-in, it's part of the UI sub-project and defines some convenience functionality of how error might be handled, but opens the door to supporting validation errors any way you see fit. In conclusion, I would argue that while in this example the lines of code may be equivalent, the benefits should be seen particularly for larger applications and for interaction with designers. I do not want this to come off as me bashing Play Framework. I have nothing but respect for the framework and the developers that created and use it. My purpose in this post is merely to compare and contrast the architectural choices in one framework against another and to hopefully better explain why I believe Hyperscala to be a better framework in many situations. Last week I did an introduction to Hyperscala and briefly outlined some really cool things it can do. This week I want to slow down a bit and take you through the basics of getting your first application up and running with Hyperscala. Requirements: Since there is a broad number of IDEs / editors used for working in Scala I won't make any presumptions in this tutorial regarding an IDE. However, I will quickly say that I use IntelliJ and absolutely love it for Scala development. That being said, the only requirements necessary to begin this tutorial is SBT and your editor of choice. You'll name this HelloPage.scala and put in the hello directory as reflected in the structure above. It's fairly simple what we're doing here. We're extending from Webpage that defines the basic HTML structure (html, head, body) and we can then add content on to it. We set the page title and add "Hello World!" to the body of the page. You'll name this HelloSite.scala and put it in the hello directory with HelloPage.scala. We simply define the val page that represents the URI /hello.html to point to a new HelloPage. The second argument is a function, so every request creates a new instance of HelloPage. We talked about Scope in the previous article but for the purposes of our do-nothing page we just have it create the page, render it, and then die when a request comes in. By default a WebpageResource will automatically add itself to the Website so there's no need to explicitly add it. Lastly, the createSession is responsible for creating a new Session that is used throughout the website across all pages. Notice the "bound to *:8080" signifies that it is wildcard bound to all IP addresses and on the port of 8080. Now just open up your browser and hit http://localhost:8080/hello.html and you should be greeted with "Hello World!". It has been well over a year since my last post. In 2011 I went to work for Overstock and moved to Utah. Life got busy and I worked during the day and when I had time I programmed on Sgine at night (http://www.sgine.org). In February of 2012 I left Overstock and moved back to Oklahoma to start my own company writing software for businesses around the world (http://www.outr.com). Life got busier. :) Now, here it is, 2013 and I've resolved to blog at least once a week on the many amazing things I get to do. Obviously this is a very simplistic example and simply sets the page title and adds a String to the body of the page. If you'd like a far more detailed example of the bare-metal type-safe HTML writing capabilities I would recommend looking at the TodoMVC example. This is all well and good if there are no designers and you prefer working in Scala to HTML and CSS. Unfortunately, this is not always the case and the goal of Hyperscala is not to make presumptions on how it will be used, so we try to accommodate everyone. So, what do you do when you have existing HTML that needs to be brought into your project? DynamicContent finds the button by its id in the dynamic.html file and loads it as a Hyperscala tag.Button and any changes I make to the loaded button are reflected at render time. I could have simply loaded the name and age inputs as well, but using bind I cross-bind the value of the input to their reflected field names in the Person class. This means that when I change the value of the inputs it updates the 'person' Property to reflect the change. DynamicContent.bind introduces two other features of Hyperscala we need to briefly discuss: Modules and Realtime. The above code requires jQuery be present by referencing the jQuery Interface and passing a default implementation of jQuery182. This will inject jQuery182 if no other implementation of jQuery is specifically provided before render of the page. The require method may be invoked with just an Interface (and an exception will be thrown at render time if no implementation has been provided), an Interface and a default Module (as seen above), or just a Module (at render time the module will be used if it is the highest version number provided for the same module name). This has been a pretty long post, but barely scratches the surface of what Hyperscala can do. My goal is to spend the next few weeks blogging about the features and capabilities of Hyperscala and get into some even more powerful features of the framework. Again, the biggest advantage of Hyperscala is that at its core it is simply a webpage rendering framework. Everything else is just icing on the cake. This means anyone that has other needs for the features of Hyperscala can simply build their own abstraction layer on top to provide whatever they want.